Germans take trash VERY seriously. One of the first things we were told when we moved here is that we better pay attention to what we are throwing away and where we put it, or we could get ourselves into trouble. Now after dealing with several government employees who take their civil service jobs a bit too seriously, we figured we better heed the warnings and not get ourselves into hot water with our trash guys. The last thing we’d want is to have trash piling up in our home because we couldn’t follow the rules. If you live in an apartment complex, you will often notice that not everyone sticks to the rules quite as vigilantly as they should (especially if the other trash containers are full) but for the most part, people are quite conscientious about their trash. And when you live in a house and pay for your own trash pickup, they will check what you’ve got inside your trashcans from time to time…so you want to make sure you’re not breaking the rules or they might in fact skip you. 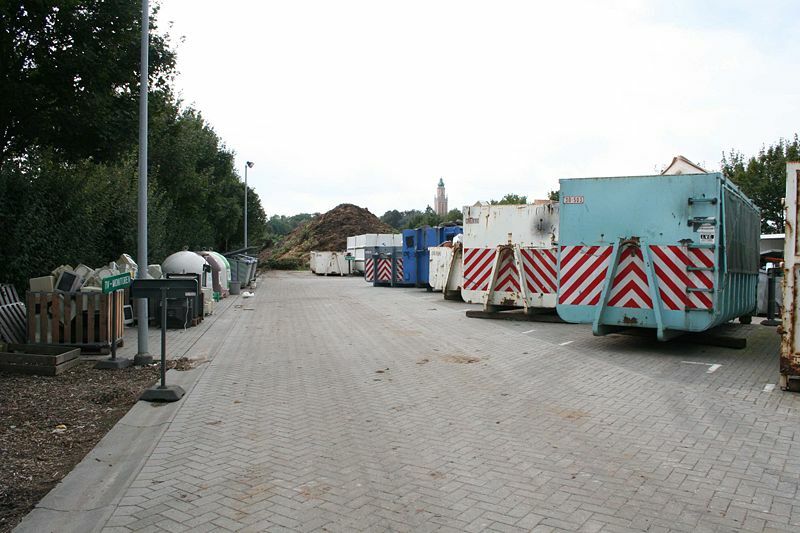 One thing that is really great about German trash collection is that they are very keen on recycling. And for the most part, they make it easy for you. You’ll usually be able to find out what local trash collection services are available by looking at your trashcans or on your local city’s information website. You might even find some of them on Qype (if you live in a bigger city) under “Dienstleistungen” or “Services”…or if you need a special container for building materials or other large Restmüll (regular garbage) throw away sessions…not that we would know anything about that, having thrown away about 130 sq. meters of random trash in containers like that since we bought our farm. Generally there is a calendar which is published at the beginning of each year and distributed to everyone, or your local town/city website will make it available for download. I usually end up putting ours in my google calendar because it seems that the days of the week are constantly changing and when you’re trying to keep up with FOUR primary trash picks and a few extra pickups each year for Sperrmüll and Gartenabfall, you need a few extra reminders that it’s trash day. And since our guys often come around before 6am, dashing out to the street real quick is not something I look forward to. Biomüll — This is usually the stuff you would otherwise compost like vegetable peelings, overripe fruit, etc. Generally people will flush things like leftovers (assuming they are in small pieces) because garbage disposals are not all that common here. Yes, I miss our disposal dearly. Altpapier — Newspapers, magazines, junk mail, torn up boxes, paper packaging, etc. In some places, you can put an additional box or two of paper next to your trash can and they will take it. Or you can have the lid propped open with all the paper inside practically overflowing. But in other areas, this is totally not allowed and they will leave a tacky note in your trash can telling you not to pull a stunt like that again. Gelbesäcke/Gelbetonne — Literally translated as the “yellow sack” or “yellow ton,” this is for plastic and styrofoam packaging…and not much else. Restmüll — The rest of the trash that doesn’t fit into any of these categories, but isn’t batteries, electronics, toxic chemicals, glass. Sperrmüll — Special pickup, usually once in the spring & once in the fall, for big stuff like furniture, household stuff (nothing electronic), toys and so on. Gartenabfall — Again, only a couple times a year, this is a big trash pickup for things like tree trimmings, leaves, grass clippings, etc. You can either buy paper trash bags that can be used for this purpose, use little fold up garden waste containers that are also popular for this, use cardboard boxes which will usually be emptied and left on the curb for you or find other containers that are easy to dump out. Tree trimming should be around 1 meter (3 feet) long and bundled with twine so they can easily be picked up. People will usually plan the trimming of shrubs and other yard work to coincide with this pickup day. The most complicated of these to conquer is the yellow sack. And after nearly 10 years in Germany, we still aren’t 100% certain what really goes in there. 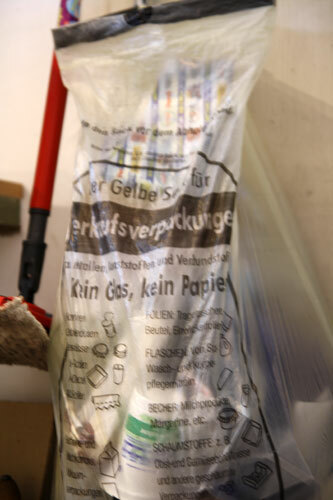 We’ve always had these flimsy yellow garbage bags that were provided for free at our local Rathaus or even dropped off at our door in our old neighborhood. But as of last week, we are now the proud users of a Gelbetonne…which serves the same purpose but it’s a big trash can that has to be fit in along with the other 3 huge cans we already have. I’m actually more than a little happy about this change because despite us rinsing out everything that goes into the yellow sack, the mice always find something in there to munch on. So now our yellow sack hangs on a hook, far off the floor, and I dump it into the big trash can from time to time. No more piling up of sacks for weeks until they come to collect them again which means no more mice tearing up the bags. If I didn’t have a guide sitting next to me with all this written out which came with our new trash cans, I seriously would have gotten a few of these wrong! Now you might be wondering what you do with everything else? Do you just let it sit around and wait for a new home owner to deal with? Perhaps. 🙂 But whether or not you actually have curbside pickup for all these kinds of trash, you will usually also find a Recyclinghof (gotta love that Germ-lish) somewhere in the vicinity of where you live. Here you will find lots of big trash containers or dumpsters that not only accept the usual trash, but also things like old clothing and shoes (that actually goes into donation boxes), car batteries, big garden waste, large collections of paper boxes, old wood, building materials, metal, electric stuff, glass and so on….these are all things that you are generally not supposed to throw away in your household garbage or along with any of the other trash collections. In fact, we have glass containers all over our little village and you will often find them, along with clothing collection bins, at local grocery stores. So now it’s time for the questions and crazy trash stories. My head is swimming from all these trash facts. But here’s a little something that shocked us in our last house. We had tons of moving boxes (that we now realized we could have gotten rid of on freecycle in a heartbeat) and had been told by our paper trash guys that they would not pick up the flattened boxes next to the curb. SO we piled up some boxes and hauled them down to our local “Wreckle-hof” (long story but that’s what we now call the Recyclinghof). The guy tells us it’s going to cost something like €4 per box to throw them away. So we laughed at him, turned around the car, and week by week tore up those boxes so they’d fit into our Altpapier trash can until they were gone. True story. I say hurrah for Germany! I wish recycling were taken as seriously here in America. I read just yesterday that while Germany recycles about 70% of its waste, here in America the total is nearer 33%. We have no curbside recycling in the area in which I live but my wife and I separate our recyclables and take them to a drop off point once every two weeks. I even keep my tiny hearing aid batteries and once a year dispose of them as hazardous waste. When I lived in the country and kept animals we recycled all our organic waste by feeding it to the pigs and chickens and turning it into eggs and pork chops. The animal waste was composted and used for fertilizer in the garden. So very true. We had some curbside recycling when I lived in parts of Miami, but most places there was none. And it’s just such a shame too since it would create a lot less landfill stress. Those figures are pretty staggering and I definitely don’t see how it can keep on that way. Sometimes it’s a hassle to do the right thing and recycle, but the alternative of one day having huge piles of garbage in our backyard because we’ve run out of space otherwise is also not too nice. We don’t buy much in packaging and try to buy fresh produce so that usually has no packaging either. Plus over here they’ve been using cloth bags and baskets for a long time and charging people for plastic bags (which encourages them to reuse them) which makes a huge impact. We never go anywhere without cloth bags; you never know when you might need them. We’ve all got to do our part to keep this world going. Otherwise it’s going to end up looking like a barren wasteland for the next generations. I had no idea that Germany had a trash system like this. It’s great that Germany is so concerned with having people recycle. That’s really great. Love it. It’s great to hear that a country is concerned with recycling and a better environment. Though, to the US’s credit, we’re trying to implement similar systems. I know that, from time to time, my trash is inspected to ensure that we’re following the rules. The weird thing about a lot of this is that it is different depending on locality. The general classes seem to be similar, but each city decides what can go in what bags. Definitely true. There are slight variations with each one. And in our area, they’ve now removed the bags altogether and just given us a trashcan, so you have to remember on your own lol. I love the Germans for the recycling efforts, but sometimes they just make it harder than it really needs to be! Thanks for sharing, Jay. Seems quite similar to Germany. We have glass recycling containers spread around the communities as well (usually located within a few blocks of homes). But batteries not. Those we can usually drop off at stores that sell them (they have a little box by the exits) like home improvement stores and even some of the grocery stores. But even here in Berlin, they still only do pickups of the various trash cans (paper, plastics, food trash and the rest of the trash) once a week. On your list for Recycling I missed the glass! Which we recycle seperated by colours: green glass, white glass and brown glass. But what if you have a blue glass?! I actually saw a show on German TV once where they were talking to trash officials and they asked about the blue glass — the guy was completely stumped. I usually put in the green since I think they ultimately mix most colors in our area…but it’s a bit crazy!